I admit it, I’m a Shake ‘n Bake addict. It started when I was a kid. My mom would make Shake ‘n Bake pork chops on occasion and I loved them. They became a common site on my dinner table years later. Today, I make my own Shake ‘n Bake mix, often coming up with my own flavor, like chipotle, and now my over-the-top delicious curry mix. I was blown away by how much I loved this curry Shake’n Bake mix on pork chops (I’m sure it’d rock big time on chicken too!). Just the right amount of curry flavor, the mix adheres perfectly. Every bite is packed with flavor and is oh so juicy. 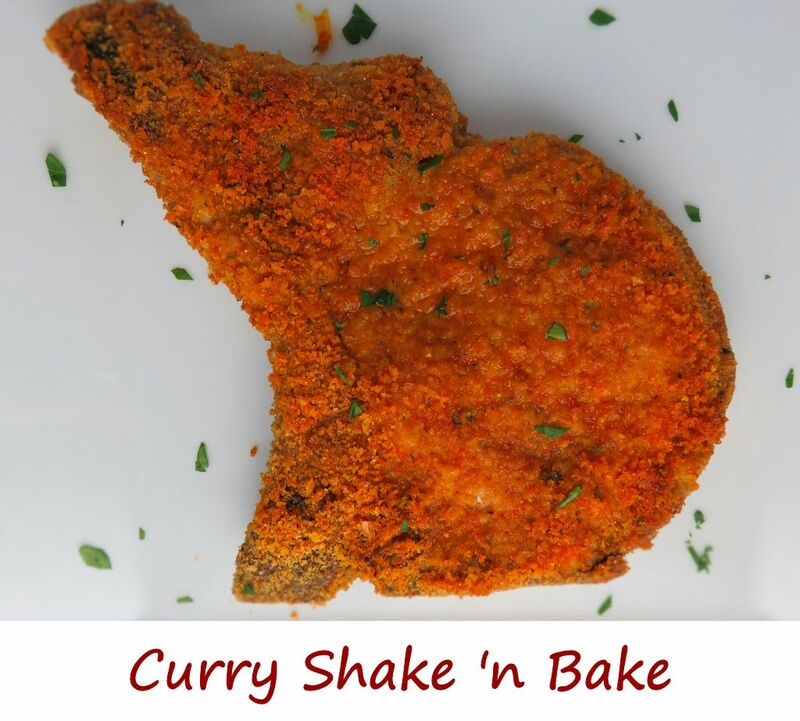 I loved these curry Shake ‘n Bake chops. They were fantastic! If you really like the taste of curry, I would definitely recommend adding more curry than I state in the recipe. You can taste and add more as you mix. I found the two tablespoons to have a nice, fairly mellow curry flavor. If you prefer yours to be stronger, go for it! You’ll love it! Curry is also great on chicken wings. Try my brown sugar curry wings. Add the oil and stir until the lumps are all gone. Store in an air-right container for up to 2 months until ready to use. Rinse chops and pat dry. Working in batches, transfer chops to a resealable bag. Add curry Shake'n Bake mix. Seal and shake to coat chops. Shake off excess coating and transfer chops to a foil-lined baking sheet. Working in batches, transfer chicken pieces to a resealable bag. Seal and shake to coat chicken. Shake off excess coating and transfer chicken to a foil-lined baking sheet. Bake for 40-45 minutes for bone-in chicken or 20 minutes for boneless chicken until done. This entry was posted in Main Dishes and tagged curry pork chops, Curry Shake 'n Bake, recipe, shake 'n bake, shake and bake pork chops by Mike. Bookmark the permalink.